Everyone has a recipe for hamburgers. There are many various with milk, eggs, breadcrumbs etc. I have tried them all. Then one day it came to me, why am I constantly trying to add flavour to the mince instead of enhancing the meaty flavour. Isn’t that the whole reason we have burgers in the first place, is for the MEAT. We are all carnivores?? Vegetarians turn away now. Its also about how juicy and moist we can make the meat so that when you bite into each bite it drips down your hand and all over what your wearing. 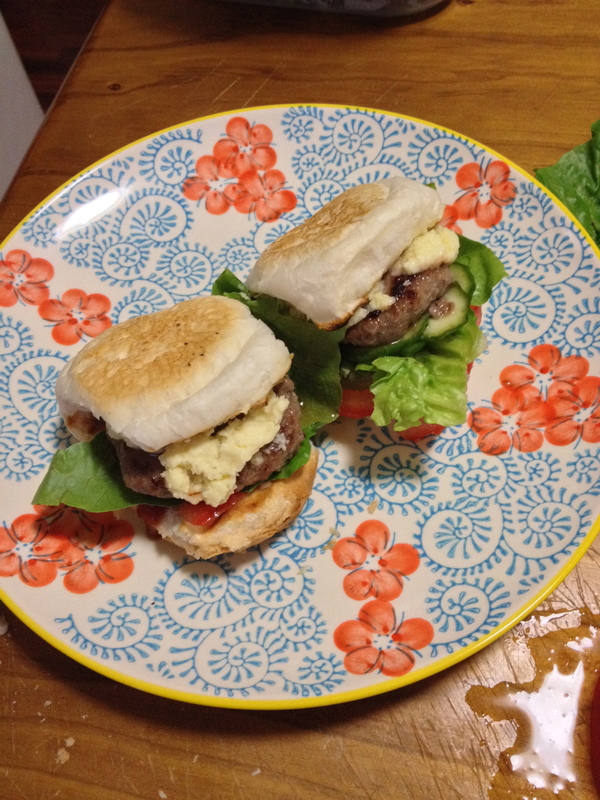 So in this vain, I thought what is the best thing to enhance the flavour, so here is my tried and tested slider (hamburger) recipe. I have made this version with 500g of mince but you can make it into larger portions, just increase the measurements slightly – also to taste. 1. Place mince into a bowl and add all other ingredients. Mix with a fork or your hand until mixture is all combined. Measure out 1/3 cup size patties – flatten slightly to ensure even cooking time. 2. Place onto a tray lined with baking paper and refrigerate for an hour. 3. Cook as per your liking – either on a hot plate, BBQ or fry pan. They will only need around 4 minutes a side to ensure that they are juicy. burger bun, brioche bun, cheese, mayonnaise, mustard, sauce, lettuce, caramelised onions, tomato, bacon, egg and or pineapple – and to make it truly Australian Beetroot. Slice the cucumbers finely with either your knife or a mandolin. Place into a bowl. Place the sugar, vinegar, peppercorns, mustard seeds into a sauce pan and boil until the sugar has melted. Once this has combined turn off the heat and let cool slightly. Place the liquid over the cucumbers and combine well. Place into sterilised jars and place into the fridge to cool. Will keep for a few weeks – can be used for anything, especially a ploughmans lunch.